Born: Bristol, 10 June 1975. Grand-Prix: 1998, 1999, 2000, 2001, 2002. Grand-Prix: First Aduard 1997, Third Scheessel 1998, Marmande 1998. Semi-final: Third 1997, 1999, 2002. Equal First: 2001, Third: 2000. Top Ten Finishes: 1994, 1996, 1997, 2002, 2003. Day Finals: Third 1997 (2), 2000. British Best Pairs: Second 350cc 1991, 250cc 1984, 1991. 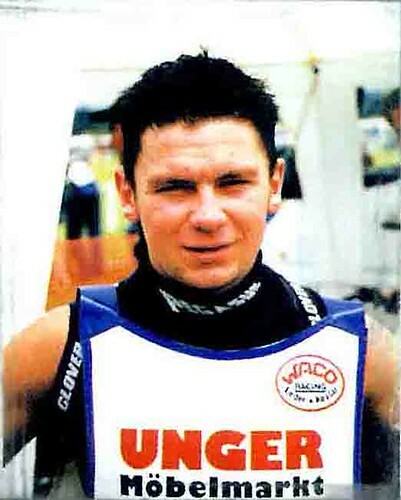 Australian Longtrack G.P. Winner: 1995/96. Oxford (1991-92, 1998), Swindon (1993-96, 1998-99, 2004), Reading (1997, 2006), Eastbourne (1998, 2003), Kings Lynn (1998), Peterborough (1998, 2000), Belle Vue (2000), Newport (2001), Somerset (2002-06), Poole (2000, 2003), Stoke (2007).